Looking at these photos of the new headquarters of Facebook, recently opened in 2015 and located in Menlo Park, CA, we can’t help but wonder: is Mark Zuckerberg copying Metro Offices? 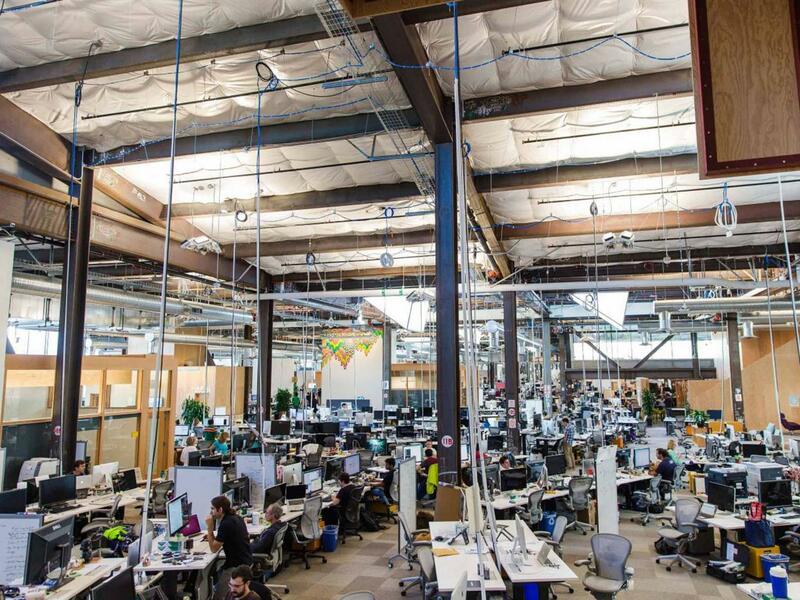 The new headquarters of Facebook, located in Menlo Park, CA, is the largest open-office workspace in the world. The Washington Post describes the layout of the world’s largest open-office workspace as “fluid and informal.” More than 2,800 Facebook employees work in a single, 1,500-foot-long space that demonstrates that increasingly, today’s firms in Silicon Valley and beyond are changing the way we work. Gone are corner offices, a distant reminder of days when there was a visual as well as a hierarchical separation between management and employees. There aren’t cubicle walls or partitions either. At Metro Offices, this is the way many of our clients like to work too. Take, for example, these shared characteristics between the Facebook office, Metro Offices’ newly-opened center at Tysons at Greensboro Station Place, and our One Metro Center, a Washington, DC, office space currently undergoing renovation. Open layout. Facebook’s office design is intended to reflect the tech company’s openness and transparency, while encouraging speed and collaboration. In fact, not even company CEO Mark Zuckerberg has separate office real estate – his desk sits out in the open too. Ample meeting rooms. While the common space is open, there are dozens of meeting rooms available in the Facebook office for times when gathering and privacy are a necessity. Minimal furniture. Every Facebook employee has a simple white desk, an office chair and a small filing cabinet. Desks are similarly small to encourage employees to be mobile. Green space. The Facebook office includes a nine-acre rooftop garden with a winding gravel path and mature trees and landscaping. Open office space at Tysons at Greensboro Station Place, Metro Offices' newest center. The Facebook office building stands out as an example of where the modern workspace is headed, and Metro Offices is riding the wave. Our latest centers support this new workstyle with modern finishes, sleek and functional furniture, meeting and collaboration spaces of every size, team rooms, lounges, community cafes, outdoor terraces and more. It’s why we received the 2015 Workspace Innovator Award from the Global Workspace Association. See our new Tysons center and our soon-to-be renovated One Metro Center, featuring innovative shared office space in Washington, DC. Metro Offices also offers eight additional locations throughout DC, Virginia and Maryland. For more information about our company and the services we provide, contact us at (703) 871-5208.